Originally published in 1988. 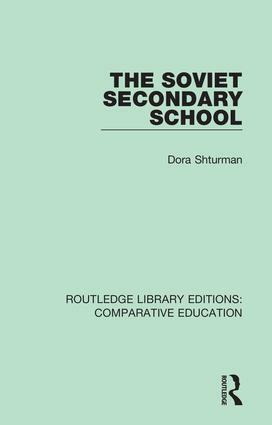 The Soviet secondary school is an important topic for comparative educationalists and also for political scientists interested in how the Soviet education system shapes the outlook of Soviet children. This book charts developments in the Soviet secondary school, beginning in the prerevolutionary period and coming right up to the present. It shows how the system was radically changed at several different points. The author, who emigrated to Israel from the Kharkov district in 1977, has considerable personal experience of the system as school-girl, teacher, director of studies and headmistress and this experience naturally colours and enriches her analysis.